• Stewart MacDonald Guitar Shop Supply Source for tools, parts, books, plans and other items. • Luthiers Mercantile International Source for tools, parts, books, plans and other items. • AllParts Source for parts and some tools. • Warmoth Replacement necks and bodies. • Lee Valley Tools Source for specialty tools, parts, materials and other items. • Frets.com Frank Ford's website for luthiers and guitar repair people. • Frets.net A Meeting Place for Instrument Builders, Repairers and Players. 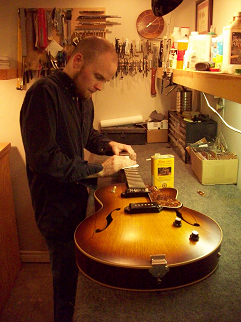 • Mike Doolin's 'Ask the Luthier' A series of articles on Intonation. Recommended reading for those interested in the Buzz Feiten Tuning System and / or Earvana.